Featuring Chris Adams, former women's ministry specialist at Lifeway, and Cathe Laurie, founder and director of women's ministry at Harvest Christian Fellowship! 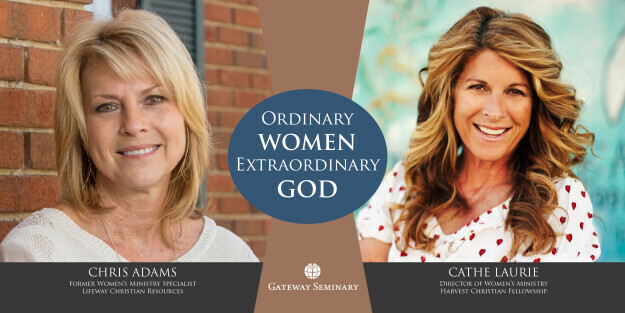 Buy your tickets now for Ordinary Women, Extraordinary God, the Women's Leadership Conference held at Gateway Seminary. Workshop topics include avoiding deception, social media and ministry, intercultural communication, gender identity, trusting God with unknowns and how to study the Bible, plus many more! Register before February 1 to receive early bird tickets at a reduced price of $50. If you cannot attend in person, sign up for the Live Stream ticket. This will give you access to the main sessions and five predetermined workshop sessions. Students can receive class credit at this conference. For more information, email .